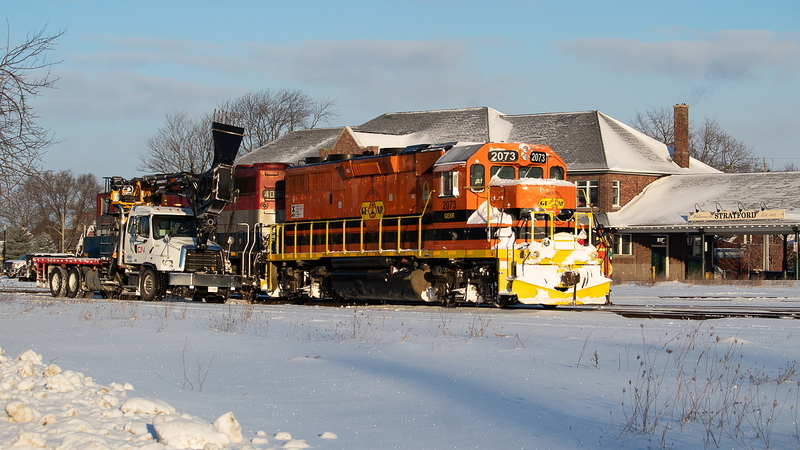 Railpictures.ca - James Knott Photo: One of the new CN blower trucks was out first thing Saturday morning clearing switches in the yard at Stratford before the crew of GEXR 581 reported for duty. Pictured here, 581 is on its way to grab five hoppers from a much longer cut in the yard. The hoppers would be set of at Broadgrain Commodities east of Seaforth from where they would head light to Hensall. For anybody wondering, as of Saturday, the plow was still sitting at the FS Partners east of Mitchell. There were some fairly sizable drifts on both the Goderich and Exeter Subs, but 581 just shoved through those on its own. Unfortunately, action on the Goderich Sub was backlit with the early morning departure, and they took the Exeter Sub so slowly that even the bigger drifts were mowed over without much in the way of flying snow. | Railpictures.ca – Canadian Railway Photography – photographie ferroviaire Canadienne. Caption: One of the new CN blower trucks was out first thing Saturday morning clearing switches in the yard at Stratford before the crew of GEXR 581 reported for duty. Pictured here, 581 is on its way to grab five hoppers from a much longer cut in the yard. The hoppers would be set of at Broadgrain Commodities east of Seaforth from where they would head light to Hensall. For anybody wondering, as of Saturday, the plow was still sitting at the FS Partners east of Mitchell. There were some fairly sizable drifts on both the Goderich and Exeter Subs, but 581 just shoved through those on its own. Unfortunately, action on the Goderich Sub was backlit with the early morning departure, and they took the Exeter Sub so slowly that even the bigger drifts were mowed over without much in the way of flying snow.